It seems that the green movement is now focused on the Yellow Pages. The city council of San Francisco recently passed an ordinance banning the distribution of Yellow Page books within the city. Whether the San Francisco ordinance holds up or not, the direction is clear. The $31 Billion annual revenue Yellow Pages are going the way of the Sears catalog. In the 1980s, Sears was estimated to have distributed over 400 million catalogs annually. Sears exited the catalog business in 1993 after the catalog division made a profit in only one of the previous twenty years. Ironically, the inventor of the catalog business, Montgomery Ward’s, exited the catalog business eight years earlier in 1985. The picture below was taken by a Montreal group protesting the Yellow Pages. It is probably not a good sign when your customers stage a protest against your product. If the environmentalists do not kill the business model, old-fashioned economics might. The Yellow Pages are currently profitable, but for how much longer? The average Yellow Page user is old and getting older. Sixty two percent of Yellow Page users are males, and their average age is 45-54 years old. One can almost feel the sand running out of the hourglass. In the world of business models, the disruptive models typical beat modifications of the old model. For instance, the Wikipedia business model destroyed the Encyclopedia Britannica business model. The Kindle eBook business model is rapidly destroying the Barnes & Noble business model. And Wal-Mart’s low prices everyday business model wreaked havoc upon most other retailers. The Yellow Pages is clinging to an eroding publishing model while trying to compete simultaneously in the online search optimization market. Technology experts will most likely win this battle as they are not entrenched in the still profitable printed Yellow Pages sector. Unlike the Sears catalog, the Yellow Pages continues its slow decline profitably and goes away in 20 years. Advertising Revenue per page continues to decline. Pages per book continues to decline making the Yellow Pages less useful. Less people use the Yellow Pages each year as older Americans lose buying power in their advanced years. Paper and distribution costs continue to rise. The combination of these factors forces the Yellow Pages to charge $5 per book to die-hard users. 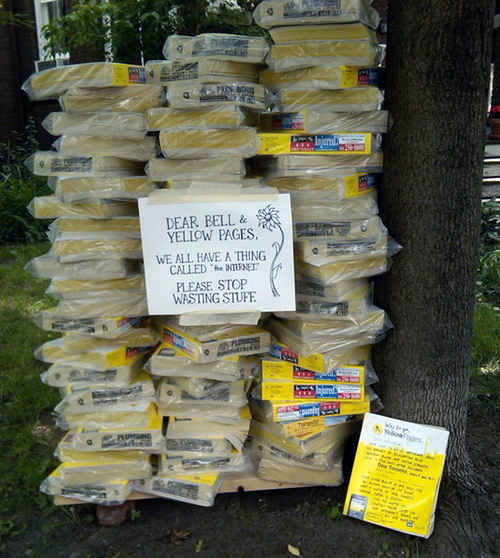 Here’s a scary one for the Yellow Pages: rather than gently complaining about the massive waste associated with forcing 1000 pages books upon unwanting consumers, environmentalists lead a protest against all advertisers in the Yellow Pages. This could very well happen. Advertisers are still paying thousands of dollars for ads because they still see some results. If the environmentalists could make an advertisement drive customers away, advertisers would accelerate their shift to other media. Google is just a fad. People realize it is easier to have a physical book and the current trend reverses—yeah, right. The lesson for businesses is actually to copy the path of the Yellow Pages. Printed versions of the book are hugely profitable. The trend towards online appears to be irreversible. Therefore, the Yellow Pages is taking the only logical option, keep the cash cow alive as long as possible.